Packing to move house can be a rather time-consuming and daunting task. Roberts & Denny’s removal packing services aim to make life a little easier for those who don’t have the time to pack up their home before moving. Relax and take away the stress while our professional packers and movers will arrive and take care of all your packing needs. Our dedicated packing staff ensure your possessions are safely stored and ready for transit. Regardless of your move size, whether it is a residential or commercial removal, we have the perfect service for you. Our accredited packing teams have the skills to pack up your belongings quickly with minimal disruption. All of our staff are fully trained to handle fragile items with complete care and confidence so you can rest assured knowing that your prized belongings are in safe hands. Every move has different packing requirements which is why we provide and sell an extensive range of packing materials and moving boxes. Roberts & Denny’s use and supply 100% recycled packing materials which are recycled again once they reach the end of their lifespan. Roberts & Denny’s professional packing teams will pack your fragile items such as ornaments, glassware, china and antiques with the correct materials to fully protect your items during transit. If required, we can also offer specialist export packing to ensure even the most awkward and fragile items can arrive at their overseas destination intact and undamaged. We are dedicated to providing efficient and trouble-free moves, so sit back, relax and let us do the work. For a free quote fill out our online estimate form, or for further information about our packing services or our range of packaging materials, simply give us a ring on 020 7635 5332 or contact us online today. 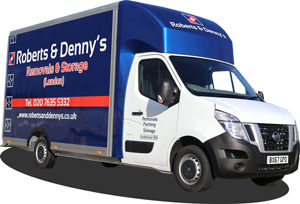 Why Choose Roberts & Denny's Packing Services London?